We decided that our resolution for 2015 is to post more about our travel adventures. Between the two of us, we logged over 200,000 miles flown in 2014, so we’re kicking off the new year with this overdue post on our trip to the Catalunya region of Spain last fall. We started with several days in Barcelona, then made our way to the excellent and seemingly undiscovered Priorat wine region, and ended with a short stay at a spa resort along the Mediterranean coastline. It wasn’t our first foray into Barcelona, a city we have grown to love as much as San Francisco. But it was our first time in Priorat, and definitely not our last. We’re kind of late planners when it comes to buying tickets and booking accommodations, so many of our top choices for restaurants in Barcelona such as El Cellar de Can Roca and Tickets were already booked. 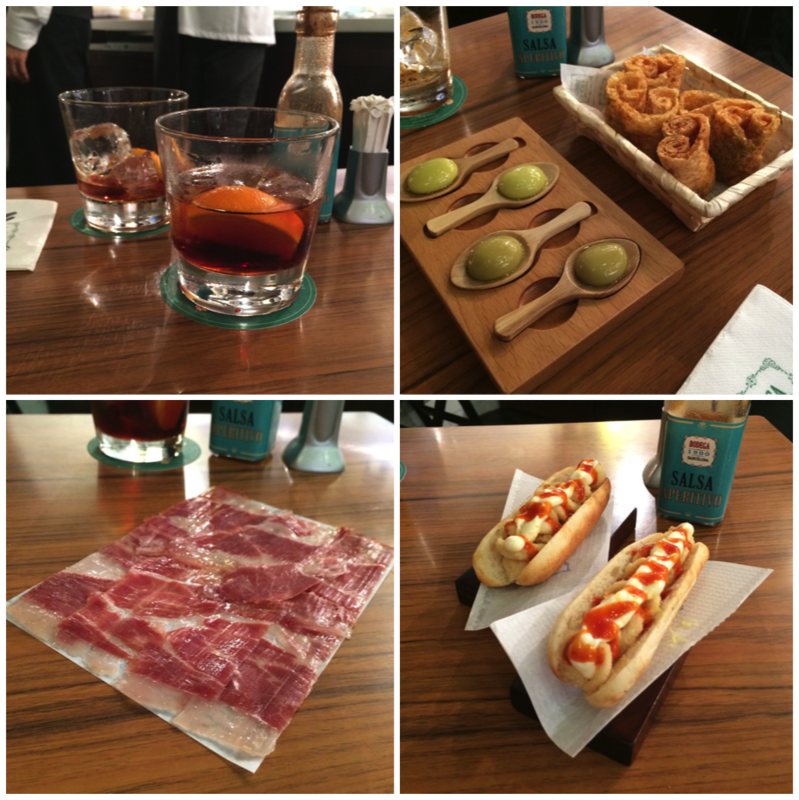 We did make it to the excellent Michelin-starred Roca Moo and frequented the Roca Bar for late night drinks and lunch, both located in the urban hip Hotel Omm. We also returned to Tapac 24, one of our favorite dining spots in Barcelona, especially for the Estrellados o Fritos (potatoes and fried eggs) dish with foie gras. We can highly recommend them all, but decided not to post about them since we dined with a larger group. Just as Roca Moo, helmed by one of the Roca brothers that own El Cellar, is much more approachable for getting reservations, tables are more accessible at the casual vermuteria (vermouth) and tapas bar Bodega 1900 than at Tickets, run by the Adria brothers of El Bulli fame. Their empire also includes a few other restaurants such as the Japanese-influenced Pakkta, which had openings, but as we’re in Spain, we wanted Spanish food so decided to have our first meal of this trip at Bodega 1900 where reservations can be made via email. One of our biggest problems when traveling to Europe is that many of the best restaurants are closed on Sundays and/or Mondays. 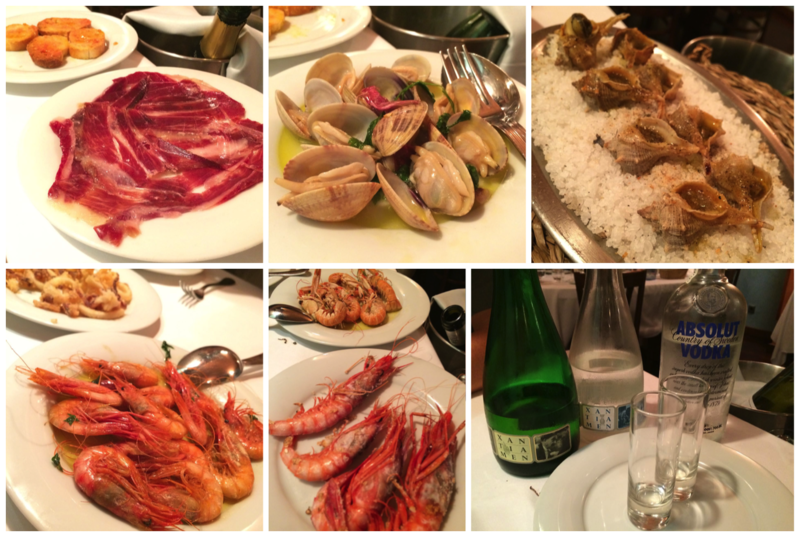 We asked at our hotel, Casa Fuster, if they had any recommendations for a Sunday evening and they sent us to nearby Botafumeiro, one of Barcelona’s top seafood restaurants. As we walked into the restaurant, we were greeted by the seafood case showing items delivered that day. We did have reservations, but opted to take seats at the long bar where the classic white-jacketed staff attended to our every need. 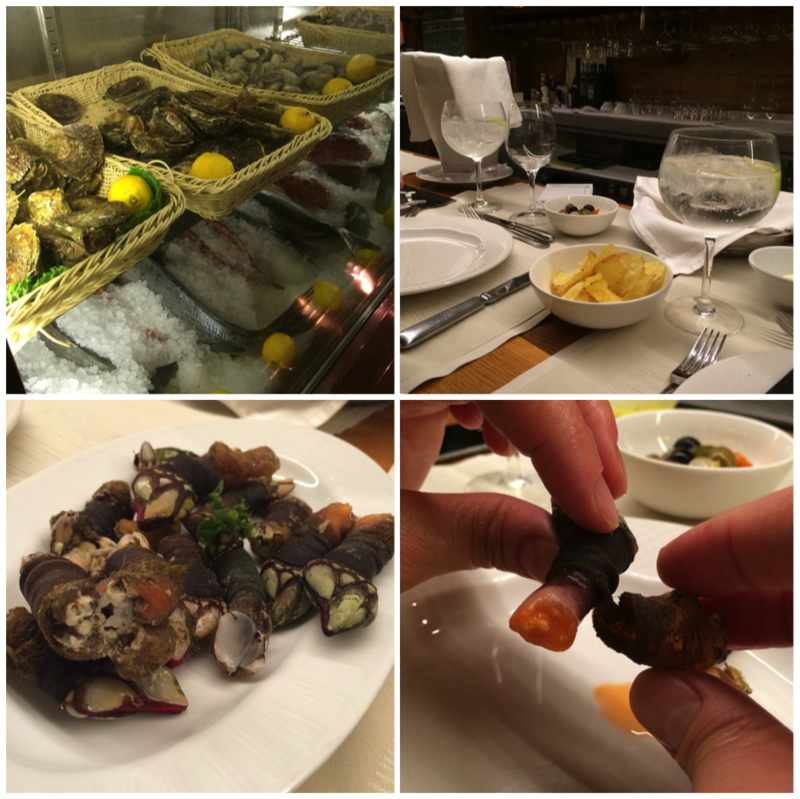 Barcelona has a plethora of great seafood restaurants, many tending to the more expensive side, but the fare is extremely fresh. We had made reservations at the harder to find Pasadis Del Pep which is literally tucked behind an ATM through a long passageway in the building. It’s been in the same location for more than three decades, offering tourists and locals alike a unique dining experience. There is no menu provided, and once you are seated at the table, a chilled bottle of Cava “on the house” is brought to the table along with plates of Pa amb tomàquet (bread rubbed with tomato and garlic) and Jamón Ibérico. Then the feasting begins. Plate after generous plate of primarily seafood dishes are delivered throughout the course of the evening. First there were clams, then fried calamari followed by plates of sea snails (conch), shrimp, duck liver and caramelized onions, squid ink risotto, langoustines then prawns. We paused at some point to order a bottle of white wine. Soon thereafter the waiter asked us if we wanted seafood or meat for dinner(!) to which we responded that we couldn’t take anymore food. Luckily we were able to stop at the “appetizer” courses, and they insisted on bringing us one dessert: a delicate chocolate parfait that we couldn’t finish even as we shared it. We presume that the check is based on how many dishes are actually consumed, but it arrived along with some post-dinner “digestivi” bottles that can be self-poured to the diners’ satisfaction. Needless to say, we over-indulged in the vodka, to our regret the next morning. These are just the highlights of our stay in Barcelona — it was time to discover Priorat, covered in Part 2.